The women of NASA are going to become hidden figures all over again. That is, if we’re talking on the toy shelves at brick and mortal stores or in Amazon warehouses. Retailers are going to have to keep restocking to keep up with demand lest the Lego action figures disappear. 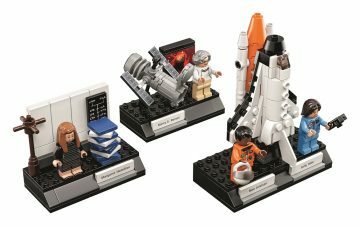 Skyrocketing sales of the Lego “Women of NASA” set, which includes three removable rocket stages, have catapulted the toy company’s new play set to the top of Amazon’s best-selling toys list in about the time it takes a rocket to achieve thrust off the launching pad. The $25 toy set, which went on sale Nov. 1, features plastic Lego figures of astronauts Sally Ride, the first American woman in space aboard space shuttle Challenger in 1983, and Mae Jemison, 61, the first African-American woman in space when she went into orbit aboard the Space Shuttle Endeavour in 1992. Also included are Lego figures of astronomer Nancy Grace Roman and computer scientist Margaret Hamilton.